Saturday morning. Actually, it’s Saturday afternoon now. I was starting a post this morning, but then Davey and I decided to go for a little hike. It was great, and I took some pictures. I want to blog about it tomorrow. But for today, it’s miscellany. 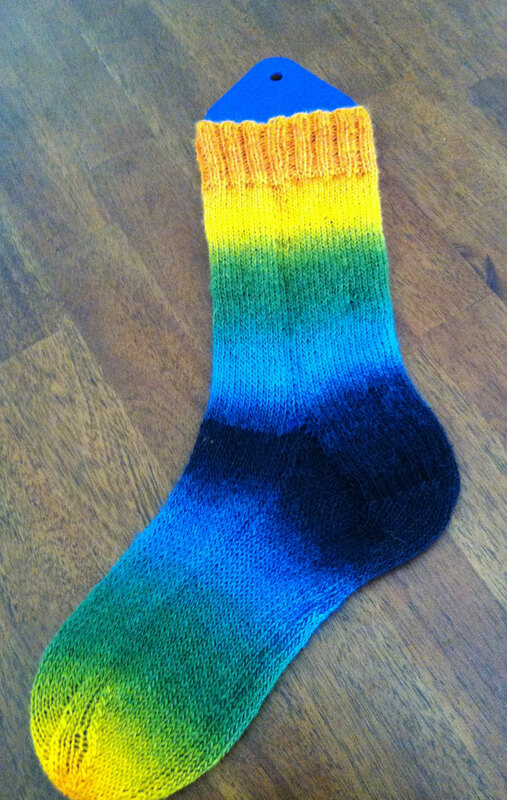 I finished a sock last night. It’s just a plain sock pattern that I like from Susan B. Anderson. I really should have it about memorized at this point. It’s top down with a heel flap and a kitchener toe. I am knitting the sock with the Zauberball Crazy yarn. I am really enjoying it. I love watching the gradual color changes emerge. The yellows are not quite this yellow. They are a little more orangy. I must have not had the light right or something. Now I am not going to start on the second sock. Instead, I need these needles to knit the pug from Knit Your Own Dog. I’ve been looking forward to starting it. I like starting things. This morning, before we left, I needed a bag to carry our picnic stuff. So I have this light backpack which had a knitting project in it. I had to switch the project to another bag. I told Davey that I have too many projects. He wisely said, “Mommy. You should just do one project at a time.” He should have mentioned that a couple of years ago. And I have a recipe I want to share. A friend posted this on facebook the other day, and I immediately wanted to try it. It is (almost was – it’s about gone) a Strawberry Yogurt Cake. It turned out really good. Davey was disappointed that there was not much icing. (It’s just a glaze.) David was a little freaked out by the parts of the cake where the strawberries were. He didn’t like what he referred to as the “housing” surrounding the strawberries. I live with particular Davids. David agreed though that it was a great recipe. I think he might prefer that I make “Yogurt Cake” next time rather than Strawberry Yogurt Cake. The strawberries are really good in it though! 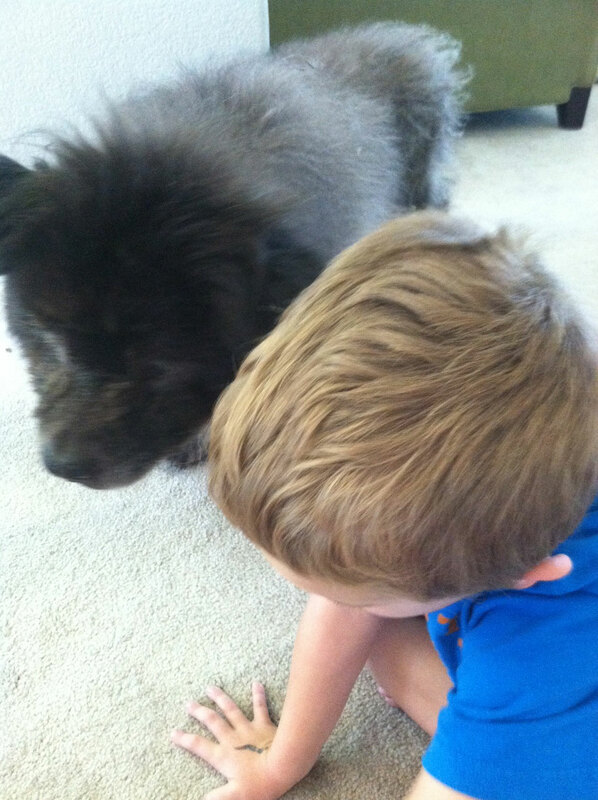 And finally, I wanted to blog about Koko puff. We’ve been taking her out for walks again for the last couple of nights. Last night, when I showed her the leash, we saw a glimmer of the old Koko. She got all excited and kept biting at the leash like she did for years when we were getting ready for a walk. Poor thing. She loved it. We just worried about her back legs which barely work, but we basically just walked about 4 houses down and then turned around. She did lots of “smells”, as Davey calls it, and we walked very very very slowly. So we’ll definitely keep doing that. Davey loves to “walk” her. Here’s the top of their heads as they look at something together. This entry was posted in Family, Knitting and tagged Strawberry Yogurt Cake, susan b anderson, zauberball by cpeezers. Bookmark the permalink.